Home Whither should we fly? I know the author very well. Known him all my life as he is my younger brother. My opinions on the book he has written A Broken Compass has nothing to do with sibling connections or brotherly obligations. It is more my professional opinion on the validity of this book to a reader. Of course ‘A Broken Compass’ mainly caters to those who are interested in various fields of a complex subject called ‘Aviation’ and more so to matters of training from the ‘ground up’ to the soaring amidst the clouds. Hence, it is a valuable eye opener to a new entrant making attempts to become a pilot as well as a remarkable tool to all those who are engaged in professional teaching roles in many different schooling programs. Duncan has been around in aviation for more than four decades and most of that long period has been spent in different fields of training. He’s heard the cheers and seen the pitfalls and navigated himself through the cabals of political mayhems that has all but corroded aviation in Sri Lanka. “So he decides to write a book” and lays it bare in his simple dedicated manner to at least mend the compass for those who enter aviation. Gives a chance to the novice to know the website glitter and ‘cloud nine’ promises of those who administer aviation could quite often become vanishing mirages. 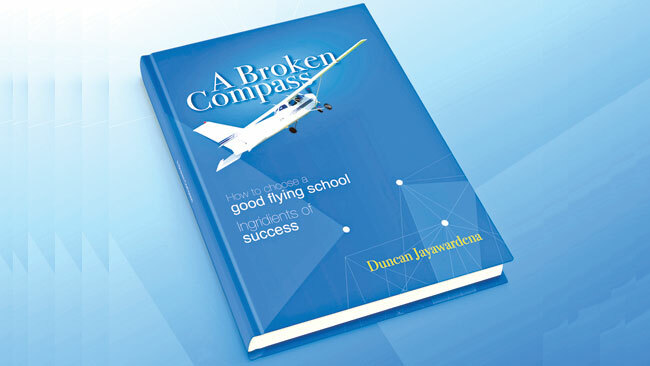 If you are a ‘wanna be’ aviator looking to obtain a commercial pilot’s licence, ‘A Broken Compass’ is a good read to at least get an idea of how the cookies crumble in the local scene. The author has painstakingly laid out the inside stories of pilot training which can educate a novice and prepare him to the path he has to travel where quite often the ‘sign boards’ are missing. ‘A Broken Compass’ serves as a good eye opener to the novice and also to the parent who is sponsoring to know a little bit more about the ‘flying training game’ than what is visible to the probable candidate. In my opinion the best part for the parent and a prospective flying student to read is summarised in page 118 as a ‘Check List’ that covers all important features before embarking on a carrier as a commercial pilot. This alone makes the ‘Broken Compass’ something of simple ‘real value’ to aviation. There are 10 advisory clips that is of paramount importance and if followed may give an excellent base to make that ever important decision to ‘be or not to be’ a pilot. The book also addresses a vitally important factor of aviation in Sri Lanka. The lack of light aeroplanes in the sky. Here of course the ‘broken compass’ is carried by the un-qualified political appointees in authority who has no vision of aviation and strut rudder-less stunting the progress in aviation that Sri Lanka richly deserves. The less said about this sad subject the better. But if one were to look at what we have been gifted in a blue sky that has seen 100 years of aviation, the result is a shame and where all that stems from is a fact that hardly needs any mentioning. As in most misfortunes of our motherland, Diyawanna Oya is to be blamed. Chapter 17 does give a ‘broad-side’ of it all. There is a lot here about instructors and methods of instruction too. Importantly without fancy elaborations and plagiarised ‘cut and paste’ jargon from the Ivory Towerish rubbish. It is obvious the author has made a valiant effort to gather his own thoughts on the subject of teaching and teachers and made his expressions purely to highlight common flaws that cobweb the system. Of course one has to read with an open mind and look into one’s self if one is to benefit from it all. But then, very few aviators in high places have mirrors and even fewer have the humility to look into them. Finally, what is this book all about? It is in many ways an educator, both to the student as well as the authorities that run schools. It is a good guide to the instructor and the civil aviation administrator. It sure is a must to the parent or the sponsor of a glazed-eyed kid who wants to be an aviator. That much is very clear to me. I would like to commend the author for a courageous step taken to place in print a whole lot of valuable information that revolves around flying training in Sri Lanka. The validities of the contents of his pages do hit the nail right on the head and gives Aviation a chance to mend its ‘Broken Compass.’ It’s time we did some repairs and found our direction as a nation, beginning from the infant flying training schools to the board-rooms that do the ‘big game hunting’ in the international aeroplane world. As it is, the subject of Sri Lankan aviation and navigating with broken compasses has sure got us deep into the mire. Perhaps it is time we did some high tech GPS corrections to show us the right way and to fly where we belong.